Plus, Oakland Cocktail Week debuts. Oakland Cocktail Week will help benefit ROC's CHOW bartender training program. The Eat Real Festival, now in its tenth year, returns to Oakland’s Jack London Square Sept. 14-16. The family-friendly event will include food trucks, DJs, live painting, and more — focusing on food, beer, and cocktails made with local, sustainable ingredients. This year’s festival will feature more than 50 food vendors, with 40 craft beers, wines, and cocktails on the menu. Besides the free portion of the festival, there are also five “Brews & Bites” events pairing local restaurants and local brews. Other ticketed events include classes on vegetable fermenting (for kids) and tea leaf salad-making taught by William Lue, chef and owner of Grocery Cafe, a Burmese restaurant in Jack London Square. There are also hidden gems scheduled during the festival, such as a dessert sculpture created by Camila Valdez. Part of the proceeds from Eat Real benefit Oakland-based Food Craft Institute, an educational nonprofit focusing on supporting artisanal food businesses. Dovetailing with Eat Real is the beginning of the first-ever Oakland Cocktail Week. “Oakland’s Got Spirit! Local Craft Spirits Showcase” will feature cocktails highlighting local craft spirits and distillers on Friday, Sept. 14, at 3 p.m. at Eat Real. During the rest of Oakland Cocktail Week, through Sept. 23, you can find specialty cocktails, priced at $10, at 40 or so restaurants and bars in Oakland, Alameda, and Emeryville. Participants include Ramen Shop, Hopscotch, Starline Social Club, AlaMar, Dyafa, Camino, Cosecha, Plank, The Aloha Club, Tamarindo, Spice Money, Belcampo, and more. A slate of ticketed events will also take place at select venues, including a screening of Sean Wells’ film Town Spirit: A Tribute to Oakland’s Enduring Bar Culture — which features local bars, bartenders, owners, and patrons at Heinold’s, Merchant’s Saloon, 7th St. Walk of Fame, The Alley, Trader Vic’s, Ruby Room, and Cafe Van Kleef — and a reception at the Oakland Museum of California. 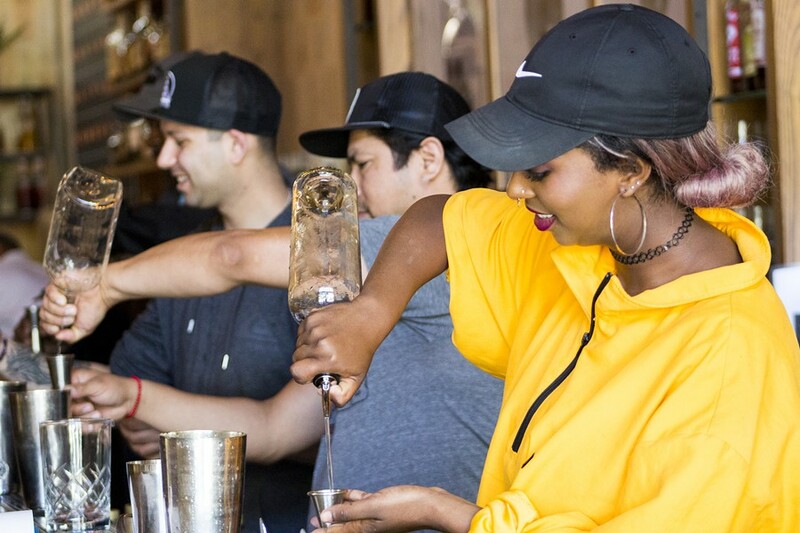 The closing night event is an Oakland-inspired cocktail battle (featuring a sponsor, Hennessy) at Starline Social Club, followed by a dance party. Partial proceeds from Oakland Cocktail Week will benefit Restaurant Opportunities Centers United (ROC United) and its Restore Oakland initiative, which is building a training center near the Fruitvale BART station. Restore Oakland is a partnership between ROC and Oakland-based Ella Baker Center for Human Rights.